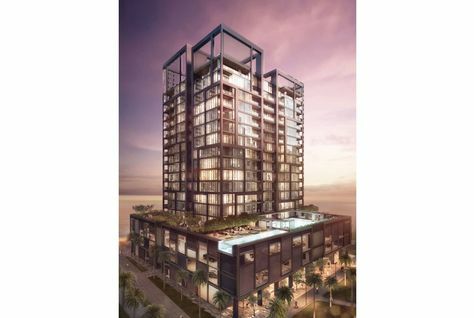 Ellington Properties has launched a new boutique residential development in Business Bay, Dubai. DT1 has already won two awards for its innovative design, which features a façade reflecting the desert landscape and allows for plenty of natural sunlight inside. It is designed to offer residents “tailor-made luxury in one of Dubai’s most iconic locations,” the developer said in a statement announcing the launch on Sunday. Covering 20,000 square metres and reaching a height of 72 metres, the building will include studios and one-, two-, three- and four-bedroom apartments, including penthouses. Shared facilities will include a fitness centre, leisure and lap pools, a games room, a reading patio, a club lounge and an art gallery. Construction began earlier this year. The developer did not say when it was due to be completed. DT1 is Ellington Properties fourth project. Managing director and former executive of Dubai’s most well-known developer, Emaar, Robert Booth, said the UAE’s strong economic outlook created “diverse opportunities” for property developers. “Our growth in 2016 demonstrated there is a discerning clientele in the market for us to reach through innovative projects such as DT1. We are confident the market will respond positively through top-quality properties that Dubai needs to continue on this trajectory,” Booth said.